Groundhog is not psychic, woman arrested for pork chop assault, runner kills mountain lion with bare hands, the good and bad side of 230 new emojis. A lot of small stories get lost in the swirl of Brexit, Trump and other bad news. Stephen Colbert of "The Late Show" regularly runs a segment where he let's us know about these stories in a segment called "Meanwhile," which are all included below. Punxsutawney Phil is a "psychic" groundhog, known for his weather predictions. 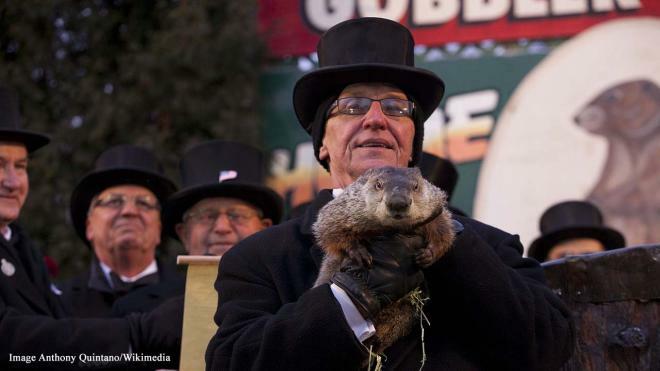 Last year on Groundhog Day, he predicted six more weeks of winter. However, the National Oceanic and Atmospheric Administration (NOAA) has come out to say Phil, from Punxsutawney, Pennsylvania, has "no predictive skill." Colbert thanked the NOAA for their tireless efforts, saying millions of tax dollars are being spent wisely. Meanwhile, Phil has predicted an early spring, which would be welcomed after the cold! A woman in Brooksville, Florida, USA got into a fight with her boyfriend recently. Jennifer Brassard, 48, cut his eyebrow after chucking a frozen pork chop at him. It looks like Jennifer has a couple of black eyes, for which she could have made better use of the frozen chop! Colbert said it was his own fault. He should have picked a fight on hamburger night.